Hi all. It's been a while since I've blogged. It's been a little hectic here. The in-laws are staying with us for the month and I've had to run around getting documents ready for our Easter holiday. We'll be leaving this Saturday to Shanghai and Japan for a one week cruise. Yay!! We are seasoned cruisers and try to go on at least one sailing per year. There are still plenty of destinations we haven't been to yet which are on the short list; Alaska and the Med are my two. In between all of this, I've been doing a couple more little projects for kid's classes, which I will put up later once the classes have been done next month. Back to this one. I've been so excited to get my Bo Bunny Serenity collection papers, that I had bought a plain wooden fan shaped ornament to decorate before the papers even came in to the shop. When they finally came in, I had to have one of everything they ordered. 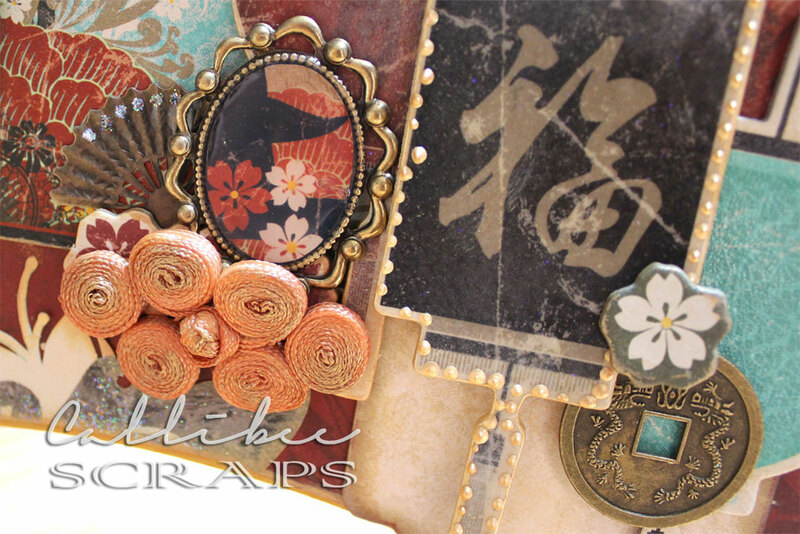 I've wanted to do a Chinese/Oriental inspired project for a while and these papers, with their Chinese characters and cherry blossoms, are the perfect foil for the fan. 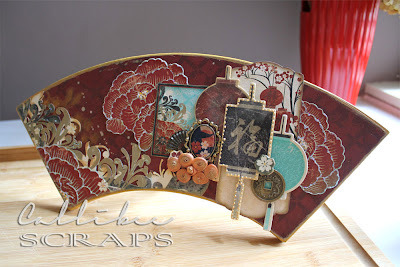 My standing wooden fan ornament featuring Bo Bunny Serenity line. Prep your wooden board and stand. 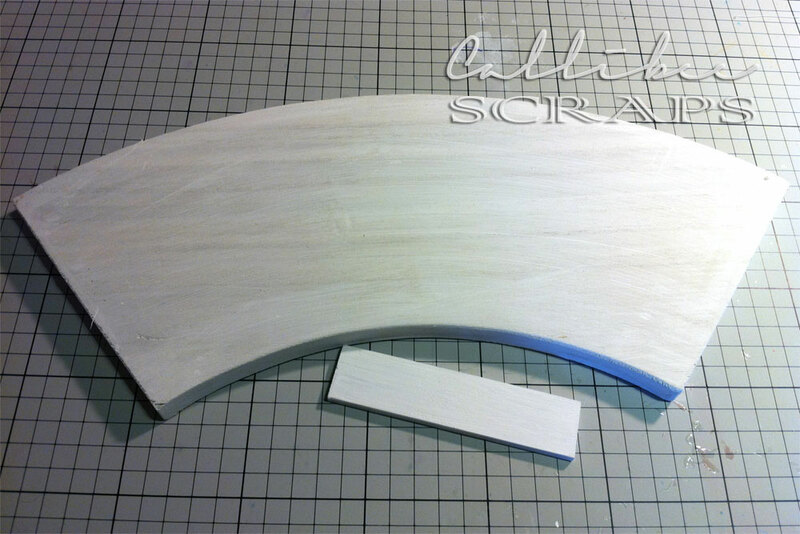 I sanded the edges to get rid of rough edges and brushed on two coats of gesso, then let it dry. 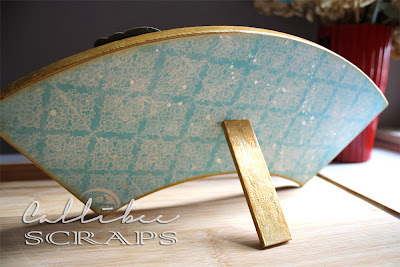 I then painted the sides with Distress crackle paint; first with Antique Linen to give the bottom colour and then with Tarnished Brass (my favourite Distress crackle colour) and let the whole thing dry and crackle up before mod-podging with the papers and layering the accents on top. The back, I covered in a beautiful blue paper from the Serenity line. Using several types of mediums, I either embossed or crackle distressed the lanterns. 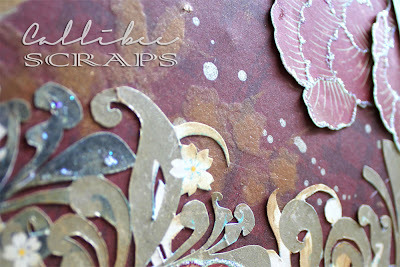 For the cameo insert, I cut some of the paper to fit inside and added several layers of Glossy Accents. The Chinese embroidery fastening was sprayed with Glimmer Mists to change it from white to a colour that matched the other accents. 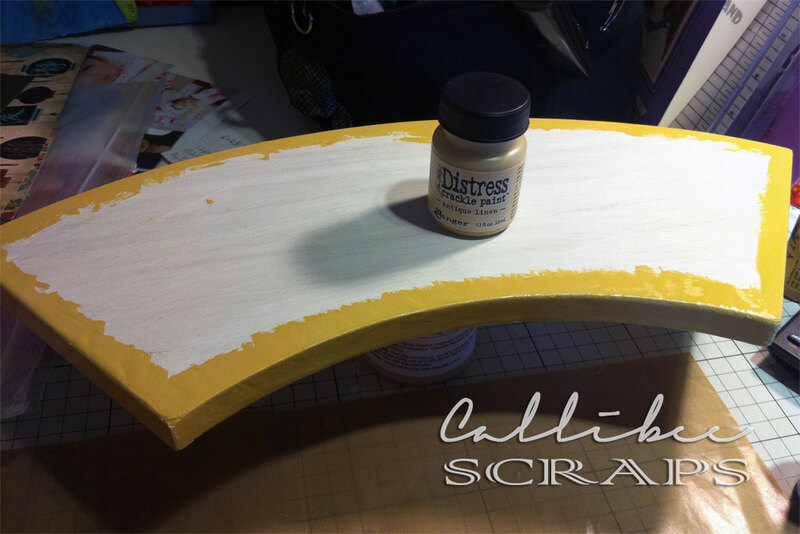 All chipboard accents were edged with gold paint. I hand cut a floral design from one of the papers to lay on the left side of the fan. Under that is a subtle image of cherry blossoms and birds that I stenciled on and filled in with gold Perfect Pearls. The blossoms on the top right of this picture were outlined with Stickles in Star Dust. Gold splash specks were made with Adirondack Gold Acrylic Paint Dabber mixed with water and flicked off a brush. I initially thought to place a couple of photos into the design but decided against it and kept it purely as an ornament. This way, it will not date with the photos and makes a lovely focal piece on my sideboard.